I hope when you get comfortable here you will take the time to post some photos of your collection(s), join as many groups as you like (click on Groups at the top of your page) , make some friends, customize your profile page (easy templates provided), write an article, make an announcement on our main forum (main page) or post in any of the specialty group forums. Be sure to visit Whadja Find (tell others what you found) and also visit the Antique Market Place. (where you can sell antiques, collectibles, art. If you need further help click on the Help Desk button at the top of your page. This feature provides answers to frequently asked questions and other tips, suggestions and information. If you are stuck on technical matters or need to report an issue use the "Report an Issue" button on the very bottom of your page. 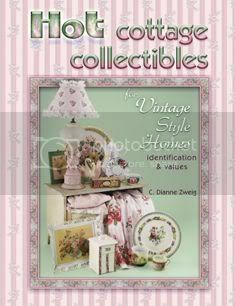 In Hot Cottage Collectibles for Vintage Style Homes, author C. Dianne Zweig offers readers a new twist on kitchen, home, and garden collectibles, marrying different periods and styles in a look which is vintage chic, country kitsch, and retro-romantic. It's all about 'cottage style,' a trendy and enjoyable way to both collect and creatively use popular collectibles, antiques, odds and ends, and treasured furnishings. This book offers readers over 900 individual and vignette photographs submitted from the top collectors out there. This fresh and exciting look at vintage cottage collectibles contains kitchenware, romantic china, pottery, French enamelware, buffets, china cabinets, tables, chairs, beds, fabric, tablecloths, chenille quilts, pillows, linens, vintage sewing projects, lighting, mirrors, frames, wallpaper, wall decor, wicker, birdcages, cottage nursery, holiday items, whimsical and flea market salvage, objets d'art, garden ornaments, tools, and other 'hot' cottage, beach, and cabin collectibles. Order it from: AMAZON or COLLECTOR BOOKS or at your neighborhood Barnes & Noble, Borders, and in the inventories of many of your favorite online sites which feature books on collectibles and antiques. Selling Books If you'd like to sell my book in your bookshop or antique store, please contact Collector Books for a wholesale discount when purchasing six or more copies at a time . I am always out shopping for kitschy kitchen, cottage and home collectibles. 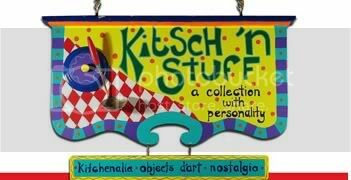 If you like buying kitchen & county store collectibles, textiles and vintage paper items of the colorful Dime Store Era or adore Cottage Style you will have a ball poking through my collections at my shop: “Kitsch-n-Stuff” is the name of my collection at The Collinsville Antiques Company of New Hartford. 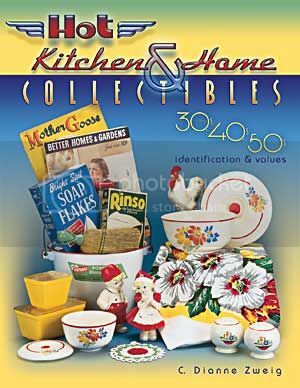 Many of these retro, vintage, and cottage treasures are featured in my books Home Kitchen and Home Collectibles of the 20s, 40s, 50s and Hot Cottage Collectibles for Vintage Style Homes and are available to purchase. If you have items for sale and would like to get in touch with me, feel free to visit www.cdiannezweig.com for more information. About becoming a moderator,NO THANK YOU Dianne , although I did a lot of digging here and diving for bottles in south fl' which id love to tell you stories about some of them .which are pretty good. (Call me Dino),, Dino in sunny Miami.